My first KROKUS album (you know, one of those large black vinyl discs in a cardboard sleeve with a big picture on it) was One Vice at a Time. The purchase was based on the cool artwork and logo - as well as the fact that I read somewhere that they sounded like a harder-edged version of AC/DC. More than 30 years later, KROKUS still plays a pair of tracks from One Vice at a Time in concert - and they haven't lost that edge. What I hear on Long Stick Goes Boom: Live From Da House Of Rust (recorded in their native Switzerland, at, well, a club nicknamed the "House of Rust") is a band of veteran rockers celebrating their career and playing to their strengths. KROKUS seems to have mostly put their metallic leanings [e.g., Headhunter (1983) - a personal favorite - and Hellraiser (2006)] behind them. Based on Long Stick Goes Boom: Live From Da House Of Rust and their last few studio discs Hoodoo (2010) and Dirty Dynamite (2013), the band has seemingly come full circle and returned to the pure AC/DC-influenced hard rock style that is the mainstay of their catalog. The band [Fernando Von Arb (lead guitar), Flavio Mezzodi (drums), Mark Kohler (rhythm guitar), Mandy Meyer (lead guitar) and Chris Von Rohr (bassist, KROKUS founder and producer of this album)] performs their classics like a well-oiled machine, but vocalist Marc Storace remains the standout. Fronted by a lesser singer, I couldn't imagine KROKUS having the same impact or staying power. His wailing tenor remains intact; actually, it's hard to believe that he can still sing so powerfully and convincingly in this register with no discernable loss of tone or control. It's an impressive performance, and I don't think that he quite gets the credit he's due as a top-notch hard rock/metal vocalist. "Screaming in the Night" - Did you really think they could leave out their signature MTV video track? "Hoodoo Woman" - Taken from 2010’s Hoodoo, it fit seamlessly into their set - and the crowd wasn’t shy about singing along! 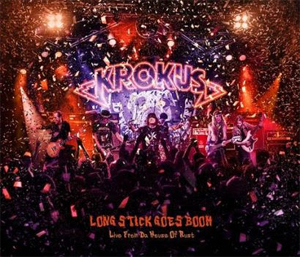 Long Stick Goes Boom: Live From Da House Of Rust is essentially a KROKUS retrospective/greatest hits package. It's also a textbook example of mid-tempo, no frills, melodic hard rock; the kind that comes across equally well in a small, sweaty club or an arena. In this case, it's the former, and if you are a KROKUS fan - or simply a hard rock afficianado - check it out. Pick up your copy of Long Stick Goes Boom: Live From Da House Of Rust in the KNAC.COM More Store right HERE.